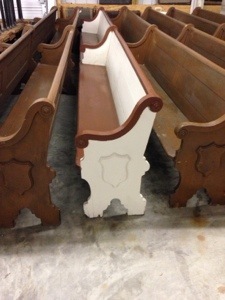 I’m thrilled to announce we now have 27 church pews for rent as part of our inventory! I’ve been searching EVERYWHERE for the perfect pews–not too 70s, not too narrow, no hideous mauve padding–and I finally found them. 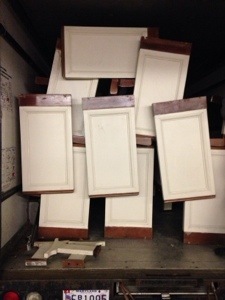 They are from the early 1900s and we just hauled them back to our warehouse. We have two styles, the ones with the crest that are 15 feet long and the white pews with more rectangular ends that are 11 feet long. Here are some initial photos I took while we were unloading. Contact us today to reserve them for your event! 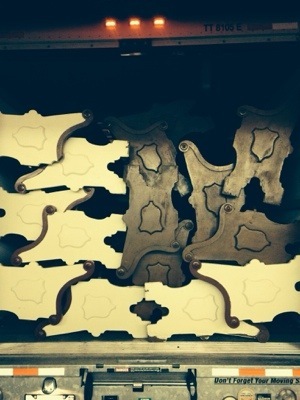 Our vintage pews coming home to DC! Our 11 foot white church pews.